Our App is packed full of some really useful tax tables, calculators and important dates, all of which you will be able to access for free! 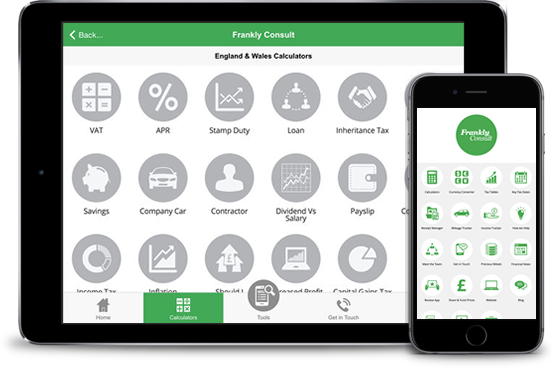 What will the Frankly Consult App do for you? We recognise that people want to be able to get information quickly, at any time so we wanted to develop a way to keep you up to date with the very latest news, views and tips from us. Whilst also providing you with key accounting information as and when you want it. You will be able to log your expenses and milage easily, and access your financial data quickly. You will be able to calculate tax liabilities in different scenarios which will help with decision making. Whilst the App won’t replace the personal relationship that you have with us, it will enhance the support that we can give to you. To navigate to the Frankly Consult app just click on the links below.